You will never believe it when I tell you where today stunning bride bought her beautiful wedding dress. Having decided a traditional wedding dress wasn’t quite for her, Dom headed off to her favourite clothes store J.Crew to find her perfect gown. Within a few days of being engaged she had already found her dream outfit, a pretty camisole with a long textured ball skirt which she would later discover was actually on sale -bonus!!! “We held our ceremony for 40 of our closest friends and family at Camden Town Hall in Kings Cross, followed by drinks and lunch at The Zetter Townhouse & Hotel. Our evening party was at the newly opened pub in East London called The Culpeper – with a great rooftop, where we opened the invite to even more friends. I knew that I didn’t want a traditional wedding dress – and really liked the idea of getting my wedding dress from a shop where I love and wear their clothes normally. With this in mind, J.Crew seemed like the perfect choice, and I stumbled across the ball skirt and camisole a few days after we got engaged and fell in love with it. I loved the fact that it wasn’t a traditional dress, but still felt very girly and special – with lots of texture and detailing. When I went back to the website, there was one skirt and one camisole left, and they happened to be in the sale so I took a chance and ordered it online…and as if by magic, it fitted perfectly without needing any alterations. With it I wore were my bangles which I wear everyday – one belonging to my Persian grandmother and another which was a gift from my mum and a new one (by Monica Vinader) which was a present from my bridesmaid the night before the wedding (which had mine and Alex’s names and the date of our wedding engraved on the inside). The shoes are my favourite heels – cream suede platform heels from Reiss. I’m only 5 ft 4, so needed some killer heels! I had my hair put up on the morning of the wedding at Cheeky in Shoreditch – I knew that I didn’t’ want to look too ‘done’ and the girls at Cheeky did a great job pinning my hair into a loose french plait on one side and into a plaited bun underneath. I did my own make up – just some blusher, eyeliner and some tinted lip balm, as wanted to look as natural as possible. I also had a bit of help from some eyelash extensions which were put on the day before. Our bridesmaid wore a simple ivory dress bought from Reiss paired with some vintage gold shoes (which had belonged to our Persian grandmother) and the groomsmen didn’t have a particular dress code, we just asked them to wear suits and a colourful tie. Alex bought his Suit and shirt from Reiss with a Tie and pocket square from Paul Smith, to match the pale pink colour of the flowers which were seasonal peach, cream and pink blooms tied with a gold ribbon. When it come to choosing a photographer we knew from the minute we looked through the reel on the We Heart Pictures website that we wanted them! Hector’s pictures were cool and natural and not ‘wedding-y’ in the boring traditional sense. I ran him by my friend Liz who is an Art Director and he got her seal of approval too! Our wedding cake was a gift from my best friend Katy and her fiance Trent. It was purchased from the Violet Bakery in Hackney (who do amazing cakes and cupcakes) and it was chocolate sponge with beautiful violet icing. I didn’t want a classic tiered wedding cake – or anything fussy so this was perfect for us. 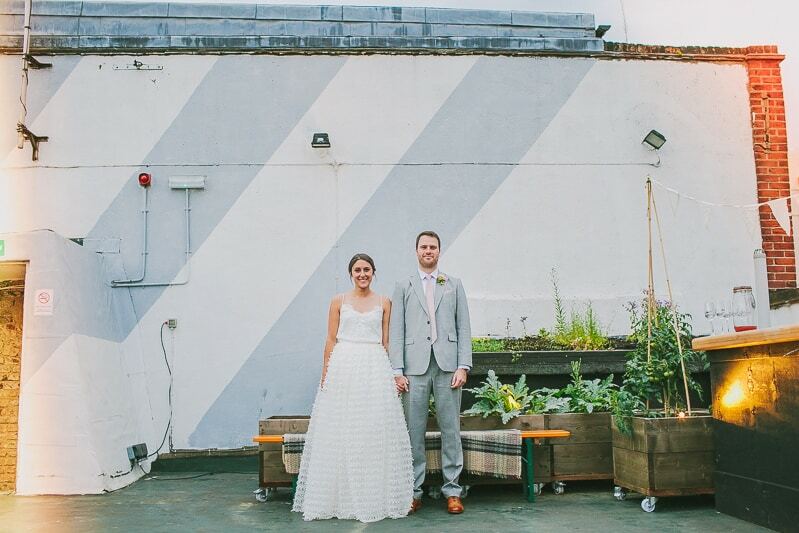 Our entertainment included ‘Strings by Xavior’ – who usually play every weekend at our favourite brunch spot – Hoi Polloi the Ace hotel, so we loved the thought of having them at our wedding. They are a string quartet who play pop/modern songs from artists ranging from Daft Punk to Fleetwood Mac which sounds bizarre but is brilliant. Over lunch we had some simple place cards for the tables, but with everyone’s nicknames rather than their proper names, and some large pickle jars of flowers. In the evening, my amazing friend Liz spent hours preparing decorations like colourful tassels and flowers and we added some bunting to the roof terrace. So tell me how many of our lovely brides will be hitting the high street to find their dream dress? A rooftop soiree in the big smoke? LOVE this wedding! Fabulous, unique and stylish, congratulations. We couldn’t agree more, it is a pretty epic view! The pleasure truly was ours!